The Gefen EXT-CAT5-6000 extends two monitors, USB, Serial (RS232) and Audio with 3x CAT5 cables up to 330 feet away from your computers. The EXT-CAT5-6000 sender unit sits next to your computer. Cables supplied with the EXT-CAT5-6000 connect your CPU to the sender. 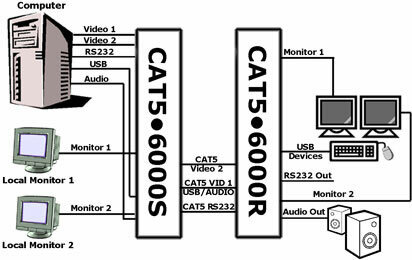 The EXT-CAT5-6000 receiver unit sits next to the monitors, keyboard and mouse - up to 330 feet away. Two monitors, keyboard and mouse plug into the back of the receiver. CAT-5 extension cables up to 330 feet connect the sender and the receiver to each other.